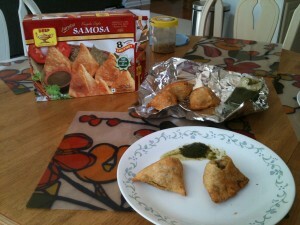 Samosas are truly beloved in the Indian snack world. Imagine a deliciously spiced mix of potatoes and green peas encased in a triangular shell of flour and then deep-fried in golden oil. What emerges is a true favorite, the stuff that love stories are made of, at least love stories like mine where food played a big role. P’s aunt is well known for her lip-smacking samosas. I, for one, have never even entertained the remotest thought of making this at home. How could I, a mere upstart of a cook, even dream of tackling the mighty samosa? Well, it’s not all that scary making a samosa, I am sure. Enter Deep Frozen Samosas. Now I am most certainly not a fan of frozen food. Most frozen foods lack praana, the essential life force energy that we derive from food, water, air and so many other sources (meditation being one of the most vital and also my favorite one). But I can make an exception especially when delicious samosas are in question. These samosas don’t contain onion or garlic but they have the perfect blend of spiciness for my palate. Also, the packet contains 2 pouches of chutney. P is confident that the chutney is a mix of coriander-green chilli type and the regular date-tamarind type. Hmmm, I am not so sure because I couldn’t discern much of a sweet flavor in there. Anyway, we took the frozen samosas out, thawed them for a bit (probably 15-20 minutes?) and then baked them. 350 degrees, 30 minutes. Voila, you have the perfect snack for dull, rainy evenings! And possibly the best accompaniment to your steaming cup of masala-mint chai. Thanks, Swapna. These are quick-n-easy samosas. Just baked some yesterday.